RV Parking is available starting on FRIDAY MAY 10th through Sunday morning, May 19th. RV’s must leave on Sunday, May 19th. If you need RV parking accommodations prior to May 10, please contact the Show Chairman for suggestions. Please fill out your information and hit submit and then order your reservation spot below! Approximately, what time you do plan to arrive? Date you plan to leave. Just the length of your RV. Tow vehicles are to be parked in the regular parking lot. Enter the number of slide-outs in your RV unit. If none put 0. We may need to contact you. Please give us your cell phone number you will use when traveling. 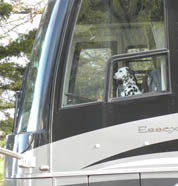 There are 50 number of RV spaces available. Make reservations using the order form in the Spotter insert or here online. The cost is $400 for the week or per night is $70. This includes electric hook-up and water. Please bring your cords and hoses. Cell phone #‘s are required with RV Reservations. All campers are expected to keep their campsites clean and orderly and leave them in as good of shape as they found them. Absolutely no dumping of gray or black water tanks under penalty of state and local laws and an AKC bench show action. Honey wagon rate made with your RV reservation is $35.00 for one tank and $55.00 for two tanks. NOTE: Honey wagon service is discounted when reserved ahead of time. If not reserved prices will be $45.00 for one tank and $65.00 for two tanks. If you have any questions regarding RV Parking Reservations please contact: Bob Smith at Cassiodals@aol.com or 440-376-4742.